Federal Reserve Board Chair Janet Yellen arrives at a news conference March 19, 2014 at the Federal Reserve Board in Washington, D.C.
Federal Reserve Chair Janet Yellen speaks during her first news conference at the Federal Reserve in Washington, Wednesday, March 19, 2014. In this low-interest-rate environment, economists have been paying closer attention to bubbles. One in particular has led the charge: Jeremy Stein, a member of the Federal Open Market Committee, the Fed’s main policy-setting body.2 Stein joined the Fed as a governor nearly two years ago, with an impressive academic résumé. He was a professor in Harvard’s economics department whose research focused on financial economics. And while just this month he announced he is leaving the Fed to return to Harvard at the end of May, his impact on Fed policy is profound and will continue to have repercussions. A key reason for the Fed’s lowering of short-term interest rates back in 2008 was to spur a recovery in housing. With home prices in free-fall and home sales plummeting, lower interest rates translated into lower mortgage rates.5 These lower rates helped soften the market correction following years of overbuilding and speculation-driven price increases. Recently, housing has been a positive contributor to GDP growth. Nationwide, home prices are rising more than 10 percent year over year. But even though they’re rising at rates similar to the pre-crisis bubble era, home prices are still well below their pre-crisis peak. Also, the number of new and existing home sales, while greatly improved from the depths of the recession, is still low by historical standards. All of this suggests to the Fed that there isn’t a bubble in housing at this time. Furthermore, this year, there are already signs that growth in the housing sector may be slowing: The National Realtors Association’s Pending Home Sales Index is down 11 percent from a year ago. It seems likely the housing market has a while to go before the Fed would seriously consider raising rates to prevent another bubble there. The stock market is a trickier story. It’s been booming in recent years. The S&P 500 index rose 32 percent last year alone. Some useful indicators comparing a company’s current stock price to its financial earnings or net worth, like the price-to-earnings ratio6 and Tobin’s Q,7 show there might be bubble-like behavior. Plotting a measure of Tobin’s Q — the ratio of the market value of all nonfinancial companies’ stock to their net worth — shows stock market valuation higher than the period before the Great Recession, but far below the tech bubble period of the late 1990s. Does the Fed care about the bubble-like behavior in the stock market? Probably not. During the 1990s’ bull market and tech bubble, when Former Fed Chairman Alan Greenspan famously spoke of “irrational exuberance,” the Fed did nothing to slow rapidly rising stock prices. Why? Because the Fed can only control interest rates, which are an extremely blunt tool for affecting stock prices. Instead, the Fed is looking elsewhere: at the bond market. That’s where Stein has been arguing there might be a real bubble. The U.S. bond market totals nearly $40 trillion, according to the Securities Industry and Financial Markets Association (SIFMA), an industry trade group. This is far larger than the stock market, which stands at about $28 trillion.8 In addition to its greater size, the bond market is also more tightly linked to monetary policy, since the Fed’s control of interest rates affects all types of bonds. What are the signs of a bubble in the bond market? Stein points to three things: first, the rising level of private-sector debt as a percentage of the U.S. economy; second, narrowing spreads between risk-free Treasuries and corporate bonds; and third, the growing proportion of corporate debt going to riskier companies, i.e. companies that have a greater likelihood of defaulting on their loans. 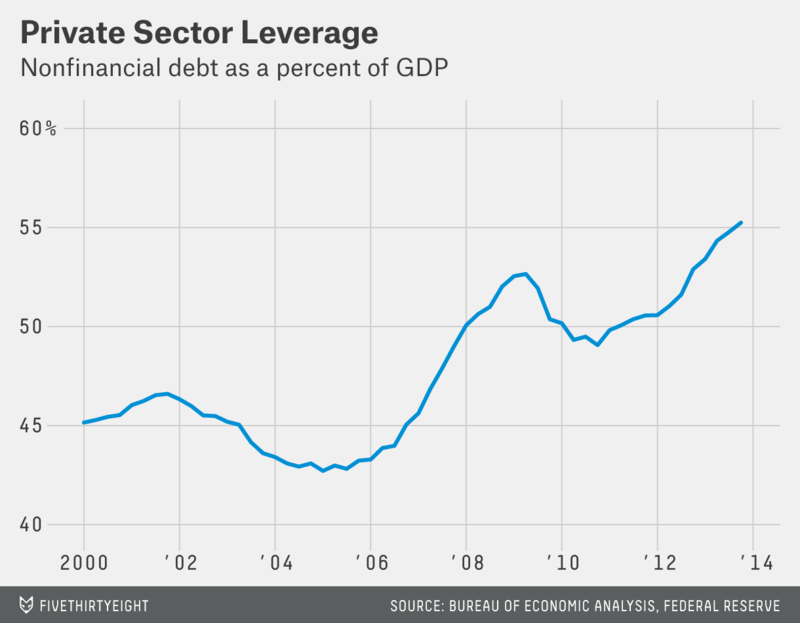 The U.S. has reached a new record when it comes to its private-sector debt. Nonfinancial companies have borrowed so much money that their debt level is now more than 55 percent of the country’s gross domestic product. Let’s turn to the second sign. The fact that companies are able to borrow money at extremely low rates — just above the rate that the U.S. government can borrow at — suggests there are lots of banks, mutual funds and large institutional investors willing to lend money to these companies. Normally, this is a good thing. But over time, it encourages companies to take on a lot of debt. Lenders’ willingness to loan out money to companies at extremely low interest rates suggests they’re not accurately pricing the growing risk of default from these increasingly indebted companies. 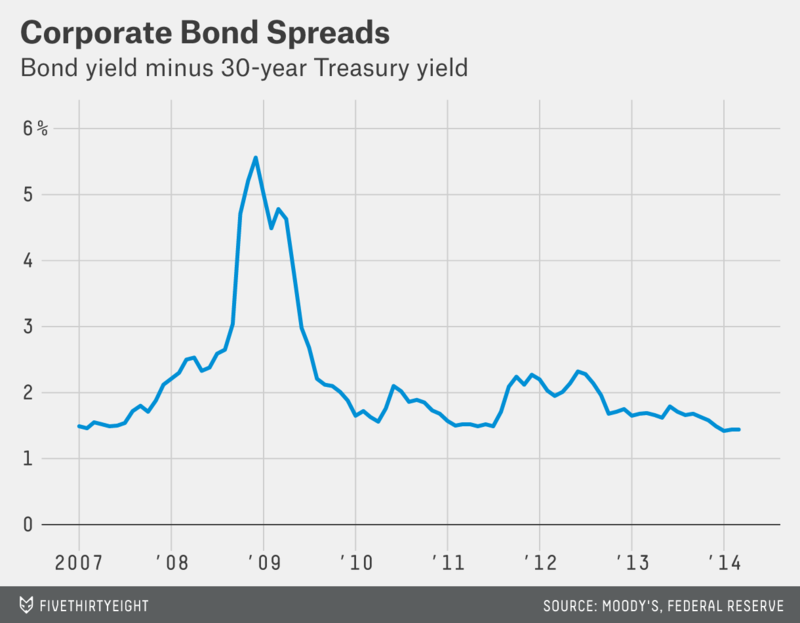 Below is the credit spread between Moody’s Baa-rated corporate debt, which is a proxy of financially healthy companies, and risk-free Treasuries. These spreads rose dramatically during the financial crisis, when everyone was extremely risk averse and not willing to lend companies money, but have since resided to lower, pre-crisis levels. 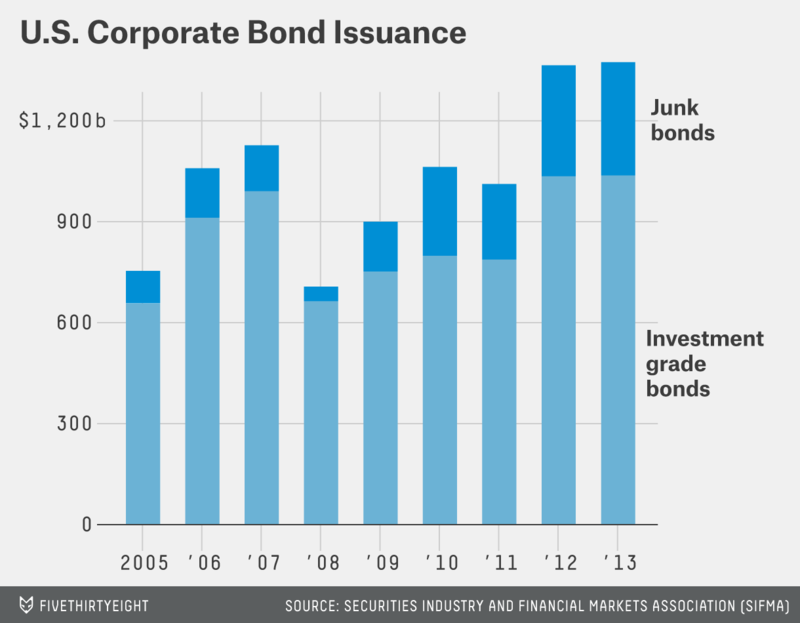 Finally, the third sign of a potential bond-market bubble — the growing proportion of corporate debt going to risky companies — is shown below. In this environment of low interest rates and narrow credit spreads, total corporate bond issuance has recovered and surpassed its pre-crisis levels. According to SIFMA, total issuance in 2013 was $1.3 trillion. Perhaps more important for financial stability considerations, as Stein was keen to highlight, is the amount of “high yield” — or junk bond — issuance, which is a proxy for riskier corporate debt. In other words, companies borrowing at higher interest rates are typically companies that are at a greater risk of defaulting; perhaps the company in question is younger or operating with a risky business model or in a riskier industry. The amount of these riskier bonds issued in the market has risen to $336 billion, far exceeding pre-crisis levels. Before the Great Recession, the Fed’s view was that bubbles couldn’t be identified before they popped, and that it was easier to clean up the mess afterward. Thus better financial regulation — whether higher capital requirements for banks, tighter mortgage origination standards, or tougher enforcement on the issuance of risky debt — was the ideal response to emerging bubbles. But is better regulation enough? Should the Fed lean against the wind of speculative fervor by raising interest rates to ward it off? Until the recent crisis, the consensus was against this idea. But in the face of low inflation, and after more than five years of ultra-low interest rates, normally conservative central bankers could be itching to raise them. And given Stein’s influence on the FOMC, financial stability could be cited as the main justification for doing so. In his departing speech, Stein argued that the Fed does, indeed, have a role and responsibility in preventing bubbles “that remain after regulation has done the best that it can do, given the existing real-world limitations.” If the Fed becomes convinced regulation alone is insufficient to prevent overheating in the bond market, rates could rise sooner than we expect. Andrew Flowers used to work for the Federal Reserve Bank of Atlanta, which is part of the Federal Reserve system. 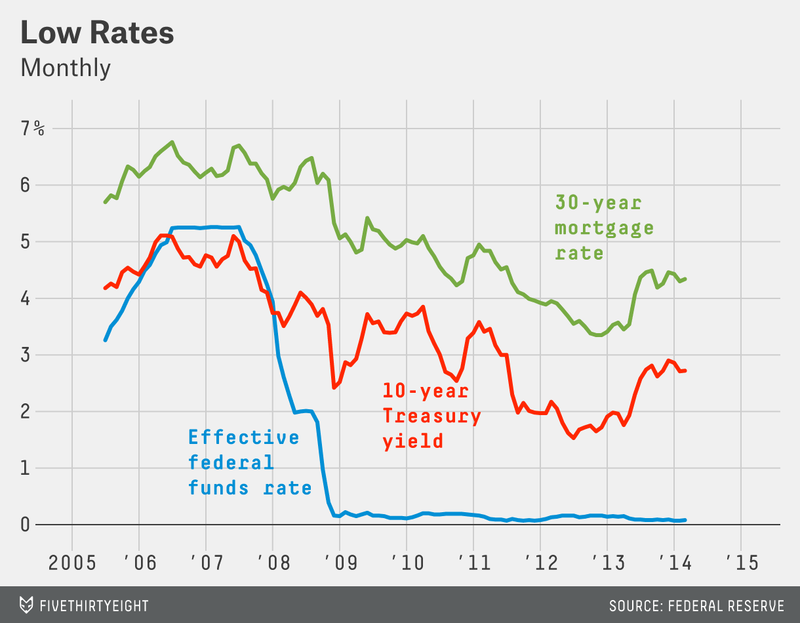 Some Fed-watchers question its commitment to low rates for long. Why is that? While traditionally the Fed’s primary duty has been to combat rising prices, this is not a concern at the moment. Inflation rates are well below the avowed 2 percent target, so this justification for raising rates seems off the table. Thus, the likely justification for a sooner-than-anticipated increase in rates is to prevent “financial instability,” or bubbles. The Federal Open Market Committee (FOMC) is comprised of the presidents of the 12 Federal Reserve banks and the Board of Governors, which is based in Washington, D.C.
Stein then presented identical remarks at two other conferences, on April 13 and April 16. This key consideration — “financial stability” — could alter the Fed’s mission, or mandate. The Fed’s current dual mandate of low inflation and maximum employment (see its statement of goals in its January minutes) has arguably been supplemented to include this third criterion, especially after the passage of the Dodd-Frank financial reform bill. Mortgage rates are at 4.3 percent now, low by historical standards. The price-to-earnings ratio is the ratio of the price of stocks to actual earnings. The theory being the higher the ratio, the more overvalued a company’s stock price is relative to the company’s fundamental value. 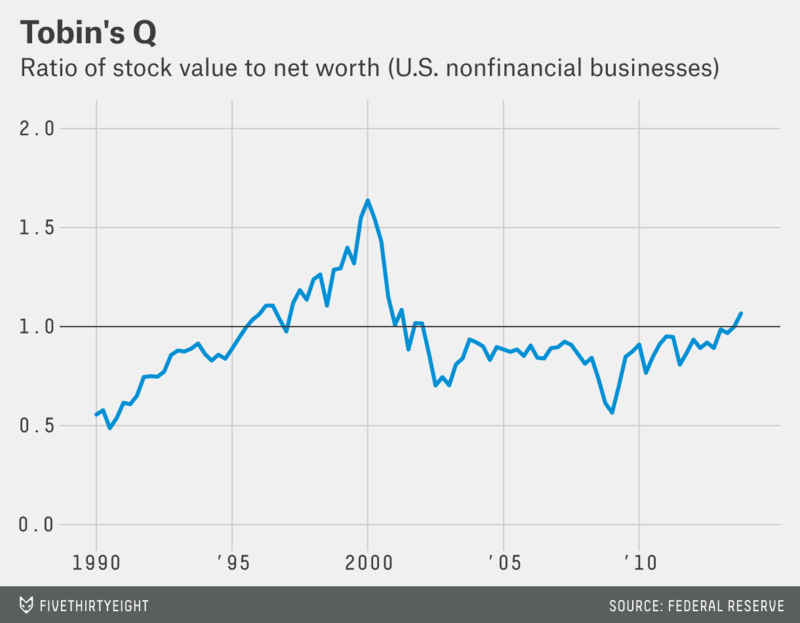 Tobin’s Q is the ratio of the market value of stocks compared to the book value (an accounting measure of a company’s net worth). The theory being the higher the ratio, the more overvalued stocks are relative to fundamentals. The data in the chart is from the Fed’s Flow of Funds statistics. According to the Fed’s Flow of Funds statistics, financial-sector equities make up $6.5 trillion, and equities from the nonfinancial sector make up $21.4 trillion.